Deaf dog: Maggie is a two year old Jack Russell Terrier. She came to her home from a foster home in New Hampshire via the Buckeye Region Jack Russell Rescue. She is an absolute angel, and is finally beginning to calm down enough to learn more hand signals. Her mom teaches her parlor tricks for treats to catch and keep her attention. She is truly a smart dog, and has the heart of an angel. She sleeps next to her mom like a teddy bear every night, and sometimes goes to work with her..
Other pets: Riley, a three year old Jack Russell Terrier; Yota, a one year old cat. Deaf dog: Spanky, a 1 1/2-year-old Australian Cattle Dog who was born deaf. 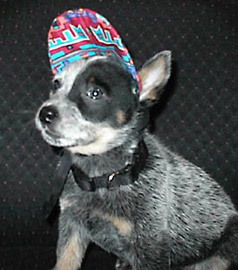 Other pets: Chloe, a Red Heeler puppy. K is 3. Both are both congenitally deaf Great Danes. Deaf dog: Henry is a Lab/Hound mix who is almost 2 years old. His family says "When I picked Henry out at the shelter I got him from, he was just sitting (very still) in his kennel looking at all the people and puppies. He looked so mellow and thoughtful so I grabbed him immediately and I'm very glad I did. I didn't realize he was deaf until he was 6 months old (I was beginning to wonder why he didn't answer to his name!). Henry's still a bit unsocialized and scared of strangers but we are working very hard to overcome that. But I love him so much. He is so cute he makes you want to cry. He's such a great cuddler; loves hugs and kisses. And he is still very mellow and thoughtful. Deaf dog: Sidnee is a 3 month old Boxer. "Sidnee is a wonderful addition to our family and we love her antics and fearlessness. " Human companions: Joy Stainbrook and her husband Grant, whom Sidnee runs and jumps in bed with every morning. 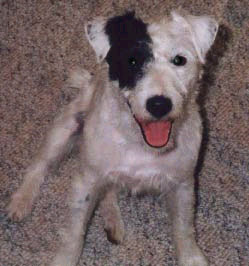 Deaf dog: Bandit is a 1-year-old Jack Russell Terrier. His Mom says, "I saw Bandit's picture on the DDEAF Dog website and couldn't resist. We drove from Ohio to NJ to pick him up. I'm probably biased - but he is perfect in every way. Spoiled wrotten and loving it. He's everyones "best friend" - man and dog - and is quite popular in the neighborhood. We've bought him hundreds of toys but he prefers a carboard box and is obsessed with shadows." Deaf dog: NoName's human pal writes: "I got my pyr pup from a family who bought him from a breeder at 9 weeks and the breeder didnt tell the family he was deaf.When we heard of him needing a home we called the family and arranged to have him brought to our house.Hes very new to our family and dont know much about him yet but i will update as soon as we learn more about him." 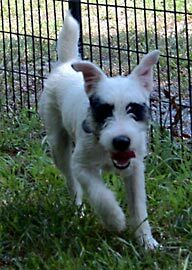 Deaf dog: Zoey is a 7 month old Jack Russell Terrier. 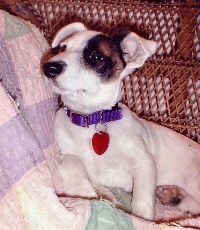 "Zoey is a very adorable, sweet and stubborn 7 month old broken coat Jack Russell Terrier. We bought her at a kennel in a nearby town. We did not know she was deaf until 2 months after we got her. She sleeps in our bed and loves to tunnel under the covers. Trouble is she wakes up through out the night barking at nothing. She is like a child in her terrible twos. Always looking to see what she can get in trouble with. When she finds something she knows she shouldn't have she darts under my bed with the item never to be seen again. She has been quite a challenge for us so far but she has definitely won the hearts of everyone in our family. Previously owning a JRT we knew that she would be a challenge but we never expected the added challenge of her being deaf." Deaf dog: Buster Boy is a one year old pure white Great Dane. "Buster is the son of my female Harlequin Lucky. I kept him because of his deafness. I no longer breed. He also suffers from other genetic disorders. We love him very much and just want him to be as pain free for as long as possible." Human companions: Stephanie Murphy and children Elissa, 4 and Erick 10. Deaf dog: Eevee is a 6 month old Jack Russell Terrier. " We adopted Eevee from a dog rescue. We originally picked her because she was all white with a spot on her eye. After a few days we noticed she couldn't hear. She gets along very well and adjusted quickly in our house. Our dog likes to chase her kitty friend around the house and play with her cousins in the creek at her grandma's house. She loves to go on walks and when she walks she prances." 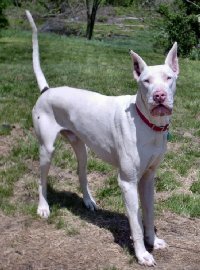 Deaf dog: Pig is a 2 year old Great Dane. "This is Just Lil' Piggly Wiggly. He is my baby! His only concern in life is how much closer can he get to the humans in his life. He shares his home with his momma and sister dane (they can both hear) as well as a basset, a cocker spaniel, and a weenie dog. Pig has learned some hand signals and is very smart. He loves to go camping with us as well as going for car rides and walks. The house would seem empty without him. One of his latest pranks is to go get dirty socks off the floor and put them in the laundry basket. He's such a smart boy!" Other pets: Cocker Spaniel, Basset Hound, Weenie dog, 7 cats, a horse and a cow.